Is there one almighty God or isn't there? We'll find out one day, but don't be in a hurry. For instance, I was standing outside Clifton Reynes church on Sunday last, clutching a Bible. Some explanation is required here I think, as I'm not known for my religious beliefs although it should be pointed out that neither am I known for my irreligious one's either. "I'm a firm 'don't ask me' person." Considering that tuning in a car radio is still a total mystery to me, I can't see why I should grapple with the larger questions of life, other than for the requirements of my sitcom. One problem I have had with religion is that I've always had an interest in illusion and magic. I remember at school, when the teacher was talking about Jesus turning water into wine, I was chastised mightily for asking "But how did he really do it?" I'd been watching the David Nixon show where he had managed to make a champagne bottle disappear. For you younger readers, David Nixon was a rather charming magician of the old school who stood there chuckling about what he'd done and clearly had more influence on me than our religious studies teacher. I've worked out the bottle gags but not the loaves and fishes, although my suspicion on that is that once someone else had brought out some food and shared it, everyone else felt guilty about hiding what they'd brought along. Those trying to persuade me that there is one almighty God, or indeed there isn't one almighty God are up against it from my point of view. I just don't see how they could possibly know either way, so it's a waste of everyone's time and as I quite rightly point out ... we'll all find out one day, but don't be in a hurry. I confess to having taken direct action against the Jehovah's Witnesses a few years back when they took to calling at my house on Sunday mornings intent on saving me. In the end, the only course of action left to me was to open the door stark naked, save only for an MCC tie, and invite them all in for some brown ale. They fled and haven't been back since and while I'm aware that there may be severe problems for me in the afterlife if they're right, it's a gamble I'm willing to take. I still have the MCC tie ready in the hallway. "However back to my recent temptation and me at Clifton Reynes with the Bible." My daughter was reading a lesson in the Children's Service which was about to start, so I was leafing through it, finding her reading, when a man approached me and said "Excuse me, are you the vicar?". Now, I've been mistaken for many things in my life, but never a vicar. I do know quite a lot about the church as I live next door to it. I really like it being there and always support their fundraisers so I had this terrible temptation to say "Yes, my child." I would then walk the man around the churchyard, boring him with every detail of the exterior stonework, but gradually taking off my clothes until I stood naked and then glance at my watch and say "Now then, I must attend to my flock" and dance into the church laughing manically. However, I didn't do that. I told the truth and just said "No, I'm not." As it turned out, he only wanted to look around the churchyard for flora and fauna and was rather decently asking permission. Whether common sense prevailed as the man was clearly a pleasant chap, or the fact that my daughter and wife would never speak to me again, or whether by some divine intervention for me not to be lead into temptation, well I just don't know. I guess we shall never know. My nephew once impressed me greatly when at school he was required to write a 500 word essay on Temptation and he wrote at the top - "It would be a temptation not to bother to write this essay". He then left the page blank and at the bottom wrote "Sorry - I have succumbed to temptation". He got a very high mark, but the teacher said "You'll only get away with that once you know" which lead him to believe that temptation is ok if you only do it once, which I think is a fair point. So anyway, my sitcom brings up temptation, and in the course of my research if anyone would care to tempt me into doing something I haven't had a go at, I'm willing to suffer for my art.I may resist it, but more likely not. Some of it will no doubt be tax deductible. 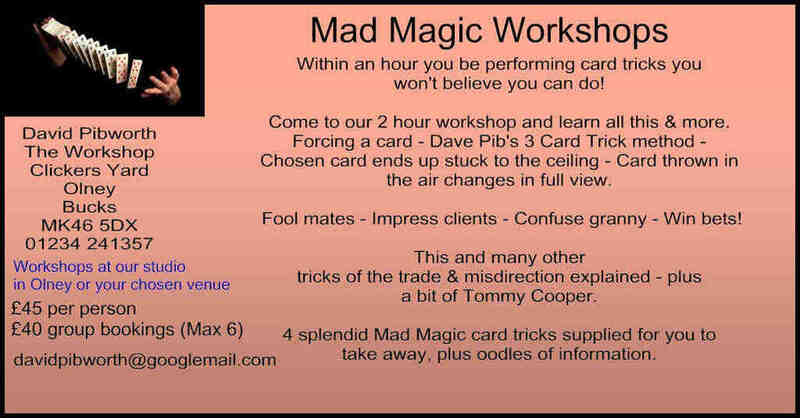 I was also tempted not to push my magic tricks this week ... but ... well .... have a look at the video. I must now get back to my sitcom.